Let me guess: you want to buy a new golf club. You looked at the price and immediately frowned. How are you supposed to pay $400 for ONE new golf club? Or what about $1,000+ for a new set of irons? That’s what I’m saying. 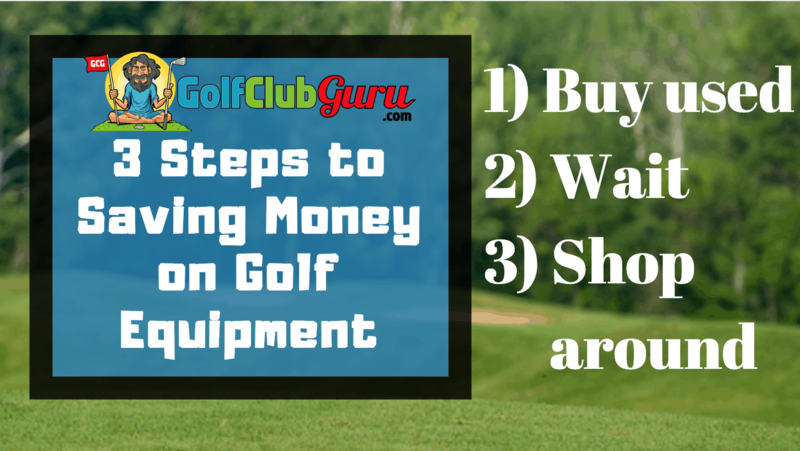 So, in this post we are going to be talking about how to save money on golf clubs and other golf equipment. First things first: I receive a commission for any items that you buy on eBay (buy clicking on my links/pictures). Thanks for supporting the website! It’s actually really simple: 1) Buy Used on eBay 2) Wait 3) Shop Around. Golf clubs are a lot like cars. When people drive a brand new car off the lot, they instantly lose a large percentage of the value of the car. That’s because the car is not new anymore, it’s used! In the same light, once you hit brand new golf clubs, they are no longer new, so they are instantly worth much less. Do you really need brand new golf clubs? Well, if you have lots of money, sure. Why not get clubs that have never been touched before? Odds are, though, you wouldn’t be reading this article if you had lots of disposable money. If you are like me (and you DON’T have lots of money to blow on clubs), you need to buy used golf clubs on eBay. Clubs that have been used just a few times are still significantly less than the price if they were brand new. Golf clubs last a really long time. Golfers choose not to use golf clubs for a very long time, though, as they want the latest and greatest clubs. Or, they blame their clubs for being bad and golf and think new clubs will make them better. Don’t be like that. Buy good value, used clubs and use them for as long as you can, until you simply NEED a different set of clubs. Example: The value of a brand new set of Titleist 718 AP2 irons is around $850, while the value of a slightly used set of 718 AP2 irons is around $550. Big difference there for a few shots already being hit with the clubs. Just wait. Yep, it really is as simple as that. Wait two or more years before you buy a golf club that was just released. You’ll save a ton of money and still end up with a club that is just as good. They release a product. They put a lot of money into designers, engineers, manufacturers, transportation services, marketing, etc. They sell a lot of that product to golfers that want the latest and greatest golf clubs available. These golfers typically have lots of money, so it’s not a big issue for them. They then have to try to “reinvent the wheel” with new gimmicky technology to trick golfers into thinking they will hit the ball 15+ yards longer with this new club. Their previous golf clubs go down in demand significantly, therefore dropping their prices. Who wins when it comes to this model? The golf club companies and those that wait 2 years once golf clubs are released to buy them. Who loses when it comes to this model? The golfers that have more money than they have sense. The golfers that think a new driver will reduce their handicap. The golfers that fall prey to the marketing gimmicks, thinking they need the latest and greatest. Example: TaylorMade just released their M5 and M6 drivers. They will likely sell for $400-$500 the first year. Then, next year, they will probably release new drivers (M7 and M8?). The price of the M5 and M6 will drop significantly in demand and price. The year after that, they will likely be selling brand new for closer to $150-$200. Here’s the best part: the new drivers won’t perform any better than the models that are 2-3 years old. Don’t believe me? If golf club companies improved distances and performance each and every year, we would all be hitting the ball 300 yards effortlessly by now. That’s definitely not the case. I don’t know about you, but I love the thrill of getting a good deal. For that reason, I NEVER buy anything before I check the prices at other places (most notably, online). Otherwise, I could be overpaying for a club. Even if you think you are probably getting a great deal already, it’s still best to check anyway. You might not realize that the item doesn’t cost as much as you think in general. No question, the best place to buy golf clubs for a low price is eBay. For example, if you go to Dicks Sporting Goods right now, you would most likely be paying $120 plus sales tax for a new Cleveland wedge. However, if you shop on eBay, you can probably get that same wedge (brand new) for $50 less with free shipping. It’s important to also consider Craigslist and Facebook Marketplace. I’ve found some great deals locally, and you are much more likely to further reduce the price by haggling. Do you have any other tips for saving money on golf clubs? Let me know if the comments below!